All DC-DC Converters | VPT, Inc.
VPT offers several lines of DC-DC converters, point of load converters, and accessory products to power your avionics, military, space, industrial, or high temperature program. Our core focus is the design and manufacture of power conversion modules for high-rel programs, whenever and wherever efficiency and reliability are critical. 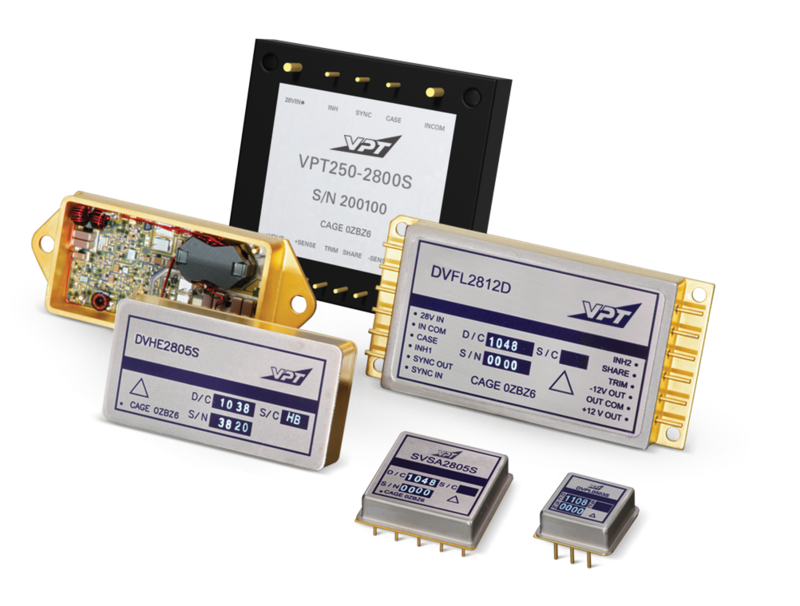 VPT offers multiple lines of high reliability DC-DC converters, including isolated DC-DC converters and non-isolated point-of-load converters as well as accessory products for space, avionics, military, and industrial applications built on decades of proven heritage. Our award-winning DC-DC power supplies have powered systems for many of the largest world class organizations and programs with efficient, reliable technology. We manufacture and supply radiation hardened and radiation tolerant power converters for mission critical space programs with a range of TID and SEE levels appropriate for LEO, MEO, GEO, deep space, and launch programs. VPT’s thick-filmed hybrid converters are suitable for flight critical applications that have extreme temperature requirements, and our specialized line of DC-DC converters for high temp environments have been characterized over the full operating temperature range from -55ºC up to 155ºC, with performance guaranteed. COTS and industrial level DC-DC converters are also based on VPT’s proven space products heritage. Our converters are designed, manufactured, and tested to withstand the rigors of avionics, high temperature, military, and space missions — proven for the many challenges of your critical mission duty. Thick-film hybrid converters for flight critical applications with extreme temperature requirements. Thick-film hybrid converters include EMI filtering plus power conversion in one small, lightweight, cost-effective package. Small size, low voltage point-of-use converters for an efficient distributed power system. ** VPT's potted modules are manufactured utilizing SMT technology and are not compliant to MIL-PRF-38534. Space DC-DC converters - a complete array of DC-DC converters in varying TID and SEE levels. *Subject to all export restrictions and export regulations including but not limited to the Export Administration and Foreign Assets Control Regulations. Further restrictions may apply; contact VPT for details.